Procesní jednotky | DENWEL, spol. s r.o. Chytrý design vychází z podrobného popisu procesu, definice technických parametrů a zvážení možných variant řešení. Pečlivý výběr vhodných komponentů odpovídá požadavkům na bezpečnost, hygienu a garantovaný výkon navrženého zařízení. Následuje 3D vizualizace celého zařízení včetně rozměrů, umístění a integrace do stávající výroby. Vizualizace současně umožňuje vzájemnou jednoduchou komunikaci a případné připomínky mohou být jednoduše vyřešeny v úvodní fázi projektu. Naše moderní výrobní a montážní zázemí je umístěno v České republice, v zemi s dlouhou tradicí a historií průmyslové výroby. Zkušení pracovníci a průběžná kontrola kvality zajišťuje, že navržené řešení se stane spolehlivým zařízením. Všechny naše zákazníky zveme na účast při zkouškách FAT (Factory Acceptance Test), kdy je potvrzena shoda vyrobeného zařízení s definovanou specifikací. Účastníci zkoušek se navíc seznámí se základním nastavením a obsluhou zařízení. V průběhu instalace a uvedení do provozu se z projektu stává řešení na klíč. Náš tým zkušených techniků a vysoce kvalifikovaných procesních inženýrů otestují všechny funkce, optimalizují nastavení a výkon zařízení, proškolí obsluhu a údržbu. 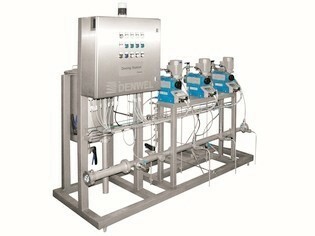 The Inline Wort Aeration unit is designed for precise and continuous Aeration / Oxygenation of wort. The DENWEL Injector ensures most efficient and instant dissolution of the gas with only minimal pressure drop, no gas loss and a fully hygienic design. The amount of injected Oxygen / Air is automatically controlled according set up flow ratio or final concentration. The amount of injected Oxygen / Air is set up by manual control valve. 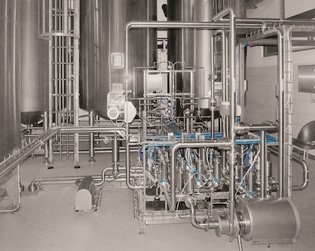 The yeast pitching system is designed for precise continuous or batch dosing of yeast slurry into the wort. 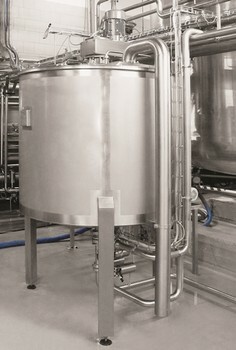 The amount of yeast dosed is automatically controlled according set up flow ratio, final concentration or batch volume. Kieselguhr preparation and Deaeration vessel is equipped with the DENWEL high speed agitator. 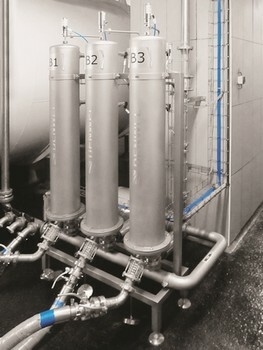 Fast homogenization and deaeration of the suspension with minimal CO2 / N2 consumption. The enhanced homogeneity provides fast filtration cake setting and consistent pre-coating; the low Oxygen improves the flavor stability of the final product. The Deaeration Lantern safely transfers beer from cellar to filter or BBT to filling and removes air automatically. Flowing through the lantern, air bubbles are released from beer and vented out by pneumatic valve. When connected tank is empty the lantern automatically switches to the prepared full tank and beer oxidation is minimized. The Deaeration unit is designed for efficient and reliable deaeration of water. The Column is filled with structured packing enabling a large internal surface which allows stripping out the Oxygen to levels below 10 ppb. No vacuum or heavy vessels are required. The Deaeration unit is designed for efficient and reliable deaeration of water including water disinfection. Water is heated up to high temperature and after deaeration chilled back to very low temperature. Energy recuperation up to 95% is reached. Oxygen to levels below 5 ppb. No vacuum or heavy vessels are required. The membrane contactor contains thousands of microporous hydrophobic hollow fibers. They form a large internal surface ensuring a maximal contact area between gas and liquid. CO2 / N2 is applied on the inside of the hollow fibers and pulled out by a vacuum. The water flows in counter current on the outside of the fibers. The high difference in partial pressure forces the Oxygen out of the liquid phase. Continuous Inline Blending & Carbonation unit is designed for precise and continuous dosing of deaerated water and carbonation of beer. 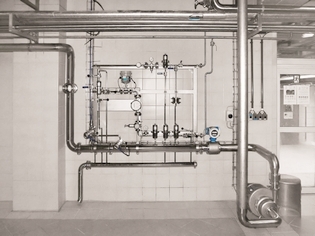 Two parallel valves of different size control accurate dosing of deaerated water. The Inline Carbonation unit is designed for precise and continuous carbonation of beer and other beverages. The DENWEL Injector ensures most efficient and instant dissolution of CO2 with only minimal pressure drop and no gas and flavor loss. 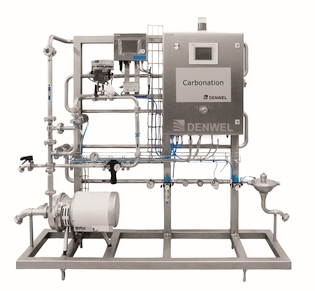 The amount of injected CO2 is automatically controlled according set up flow ratio or final concentration. The amount of CO2 is set up by manual control valve. The integrated pump with a pressure holding valve maintains required pressure for carbonation. A bypass can be used for transferring beer. The amount of CO2 is set up by manual control valve. 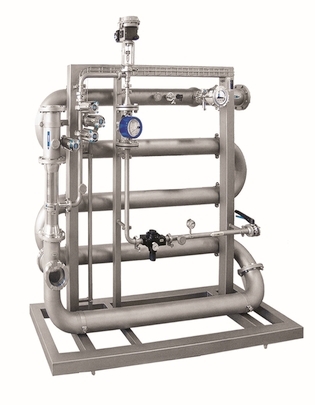 The Inline Nitrogenation unit is designed for precise and continuous nitrogenation of beer and other beverages. The DENWEL Injector ensures most efficient and instant dissolution of N2 with only minimal pressure drop and no gas and flavor loss. The high concentration Nitrogenation unit is designed to continuously add and dissolve Nitrogen into beer. The membrane contactor ensures instant and complete dissolution of N2. The mobile unit with integrated pump allows efficient batch production. The amount of injected NO2 is automatically controlled according set up flow ratio or final concentration. The amount of N2 is set up by manual control valve. 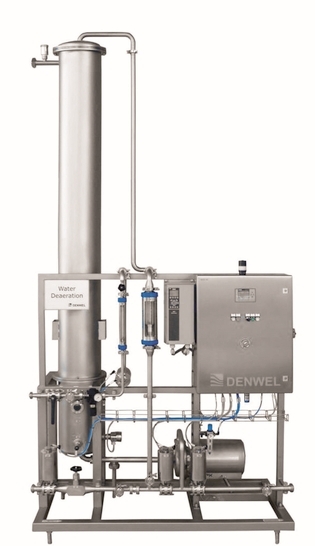 The DENWEL dosing system is a turnkey solution for continuous and automatic dosing of one or several additives into a main stream. Depending upon the additive properties, dosing range and required pressure, Diaphragm, Peristaltic, Gear, Rotary Lobe or Centrifugal pumps will be used. 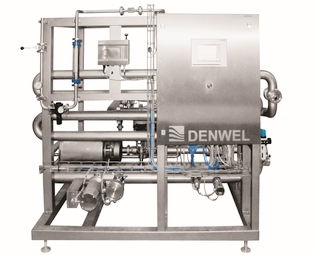 Designed for safe and reliable product treatment, DENWEL provides a semi and fully automated solution ensuring consistent pasteurization quality. 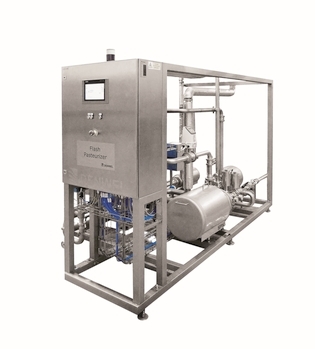 The Flash Pasteurization unit is designed for safe and reliable heat treatment of beverages. While reducing harmful microorganisms, uniform and gentle treatment is applied to maintain the original taste and appearance of the beverage. The DENWEL CIP is a fully automatic system, programmed to achieve optimal cleaning of the entire production line. 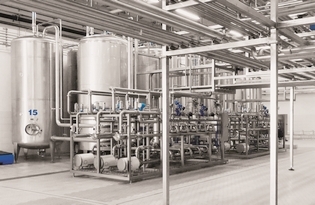 It comprises a complete set of equipment for CIP, including tanks for recovered water, acid and hot caustic, pumps, heat exchangers, valves and instrumentation such as conductivity and flow transmitters.